One of the turning points in the appreciation of ancient Chinese culture came at the turn of the twentieth century. Up until then it was common for Western scholars to consider that Chinese language and history was relatively late in development - that it really only got started with the Qin dynasty in 221BCE and so the Mediterranean and Middle Eastern civilizations were older, some went so far as to suggest that Chinese Civilization was an offshoot of a Middle Eastern culture. The analysis of the Oracle bones in the 1920s changed all that. Not only had China an advanced written language stretching back nearly four thousand years but the early historical records that had been considered largely ‘legendary’ were shown to be surprisingly accurate. In 1899 Wang Yirong ➚ 王懿荣 Wáng yì róng noticed markings on bone fragments he had bought in a Beijing shop for grinding up to make a traditional medicine potion. They were termed ‘dragon bones’ 龙骨 Lóng gǔ - like many other old bones and fossils to denote their antiquity and supposed medical efficacy. A collection of the diagrams of the marks was then published by the noted Chinese scholar and politician Wang Guowei ➚ 王国维 in 1903. This stimulated worldwide interest and many more bones and some bronzes came onto the market that had been dug up by the locals. 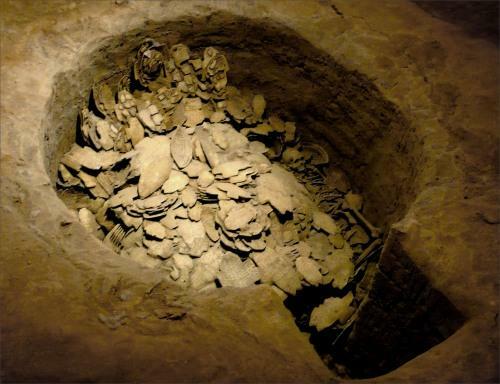 The source of the bones was traced to material washed into the 洹河 Huán hé river at the village of 小屯村 Xiǎo tún cūn near Anyang 安阳 ān yáng in Henan province. The villagers had stumbled upon the remains of the city of Yin, the capital of Shang dynasty China (1711-1066BCE) (殷墟 Yīnxū). In 1928 a full scale archaeological excavation under the auspices of the 中国研究院历史语言研究所 Zhōng guó yán jiū yuàn lì shǐ yǔ yán yán jiū suǒ was initiated. In 1936 they found an undisturbed archive of 17,000 items including bones strung together into bundles. About 10% of all the bones are inscribed. In all over 100,000 inscribed bones have been unearthed and these became scattered worldwide for study, many of them have ended up in Taiwan after the Civil War. Bronzes, large qing musical stone; tombs and many other items were also found during the excavations. Although some of the bronzes had inscriptions they tend to be shorter in length and often used older script forms. Analysis showed that the inscriptions were associated with divination. The inscriptions on cattle bones and tortoise shells was identified as an early form of the Chinese written language used in the Chinese Bronze Age. The system of writing is called 甲骨文 Jiǎ gǔ wén (literally ‘first/shell bone writing’). It is the earliest form of writing known east of the Indus river. No earlier form of writing has been found in China mainly because these writings would have been made on perishable materials such as wood, bamboo and silk (bronze was only just coming into use). Only the King of the Shang people was permitted to make a divination, a scribe/diviner made the inscription and the ruler interpreted the result. The diviner made the inscription with a sharp instrument on a polished flat scapula or leg bone of cattle; some time later the underside of tortoise shells were used instead. Tortoises were considered wise and venerable because there were known to live to a great age. The inscription was usually a short yes/no question with associated notes. A row of small holes (凹穴 āo xué) was then made on the rough back surface; then a glowing hot bronze rod or wooden stick was placed against one of the holes causing the bone to crack with a loud popping noise. The diviner (贞人 zhēn rén) interpreted the pattern of cracks on the polished side. The heat usually produces two cracks roughly at right angles: one long crack along the grain of the bone and a shorter one across it. The modern character for divination 卜 bǔ is a picture of this crack pattern, The answer was auspicious if the cracks matched this pattern - one main crack with a smaller spur at an angle. The verdict on the analysis of the cracks were recorded on the bone as either auspicious 吉 jí or inauspicious 凶 xiōng. The ruler provided the interpretation and this was usually then inscribed on the bone next to the question. The same bone was frequently re-used several times on different, un-cracked areas. China has not only the highest mountain in the world on its borders: Mount Everest (Qomolangma) but also the second highest K2 on the border with Pakistan. The inscriptions were arranged in a standard set of parts but were not always complete: a preface (giving the date and the diviner); a charge (the question being asked); a prognostication (interpretation of the answer) and finally a verification (what actually happened - did the divination prove accurate?). The standard structure and additional information have aided the interpretation of the inscriptions. About 120 individual diviners have been identified which has enabled the inscriptions to be put into historical order. Sometimes, especially when concerning royal births the king himself made the divination. Some rulers used the divination method more frequently than others - the penultimate Shang ruler Wu Ding ➚ was the most prolific diviner so most date to around 1100BCE. If an unfavorable response was received, then after appeasing the gods - sometimes with human sacrifices - the same question was repeated in the hope they would get a different answer. As no 'incorrect' divinations have ever been discovered perhaps the ruler either repeated the divination until it came out correct or the offending bones were quietly destroyed - such bones would have shown the ruler as fallible. Most inscriptions are of about a dozen characters but some are up to sixty. They were written in columns top to bottom but sometimes left to right rather than the traditional Chinese right to left depending on the direction of the crack. There was a wide range of different subjects for divine inquiry include checking whether sacrifices were acceptable, informing the ancestors of family events, predicting rainfall, curing illness, seeking fortune in hunting, war, and the wisdom of embarking on journeys. Many refer to the supreme god of the Shang as 帝 Dì. From the inscriptions the history of the Shang dynasty and the everyday life of rulers has been reconstructed. The oracle bone method of divination seems to have died out with the Shang dynasty. The succeeding Zhou dynasty used the simpler and quicker Yi Jing (I Ching) method of divination. 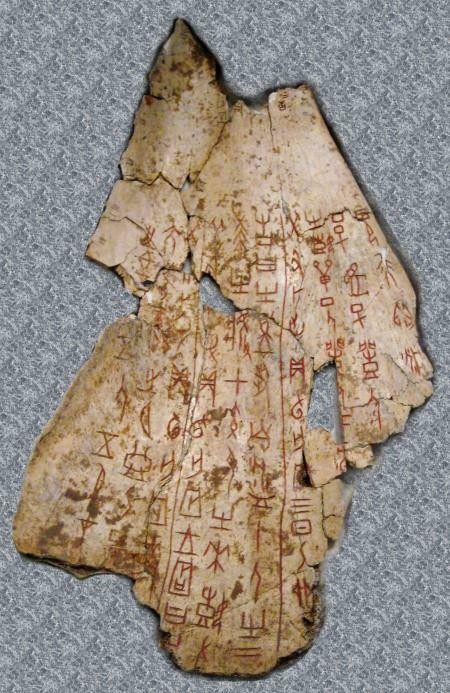 Of the 4,500 different characters used on the oracle bones, about 2,000 have been mapped to modern equivalents; others include personal and place names and so are very hard to translate. The recognizable marks are mainly pictorial characters which still somewhat resemble current forms. Although they form a small proportion of the total number of modern characters in use they are the ones most frequently used, including ‘big’, ‘man’, ‘sun’ and ‘moon’. Sometimes the characters were inscribed as a mirror image - for example 明 ‘bright’ was written as sun (right) moon (left) pair as well as sun (left); moon (right). The ancient script had already started stylizing the subject, this was proven by the discovery of older characters on bronzes produced at the same time that are more life-like representation of physical objects. This strongly suggests that the script had already been in use for hundreds of years and it had become convenient to simplify the marks – the oracle bone script was not some simple, primitive language. Writing was also made on strips of silk, bamboo and wood but as these have not survived it is the oracle bones that receive all the acclaim. A modern character for book: 册 cè (traditional form 冊) is identifiable from this source - it depicts bamboo strips tied together by two cords at top and bottom. The Chinese character for civilization 文化 wén huà is literally ‘writing transformation’ showing that writing was considered the cornerstone of civilization when people come under the transforming influence of writing. Study of the inscriptions had revealed early, astronomical study of the stars as individual stars and constellations are named. The inscriptions include the oldest observation of a nova (1300BCE) ‘A great new star appeared in company with 心宿二 xīn xiù èr (Antares, in Scorpio)’ is recorded on the bones. The traditional sexagesimal 六十花甲 liù shí huā jiǎ Chinese system for numbering days and years was used and the traditional Chinese calendar system with its twelve 30 or 29 day months and an occasional leap month was already well established. A ten day week was in operation so that three weeks conveniently fit into a month. Characters also demonstrate that accurate solar observations were being made with characters representing the solstices and eclipses. The form of the character for late afternoon is depicted with the shadow of the sun and moon. The character for ‘eclipse’ 食 shí depicts a dragon devouring the sun or moon. Advanced observations were also made of the planets. The system of Twelve Earthly branches that are the basis for Chinese astrology have there origin at least as far back as the Shang. The 12 branches are believed to come from studies of the orbit of the planet Jupiter (木星) that takes roughly 12 years (11.86) to orbit the sun, and so observation of the planet's position gives the year in the sequence. As well as proving that an advanced, literate civilization existed in China as far back as the Shang dynasty the finds show that the historical documents that had been dismissed as legends were firmly based in reality. In particular the 史记 Shǐ jì ‘Records of the Grand Historian’ by Sima Qian proved remarkably accurate. Sima Qian had recorded that the city of Yin was located on the river Huan which proved correct and his list of 30 Shang rulers in the 殷本纪 Yīn běn jì was confirmed by the discoveries - impressive considering he wrote it one thousand years after the events. Some of the names were corrupted over the centuries but 25 proved correct. Part of the kings' names was the 'ordinal number' as defined in the ten heavenly stems. For example 武丁 Wǔ dīng the 'dīng' puts him as the 4th Shang King in the sequence, 'Wu' was his personal name. Early dictionaries were also shown to be accurate particularly the 说文解字 Shuō wén jiě zì composed by 许慎 Xǔ shèn [25-220CE] who completed it about 100CE. 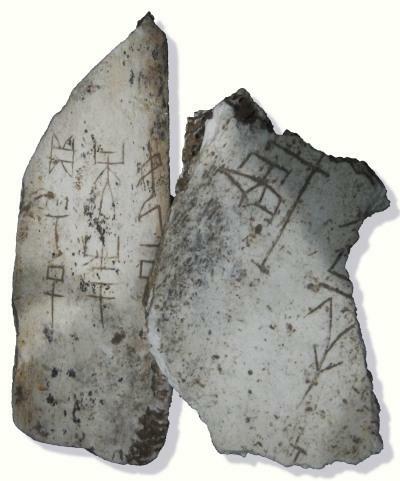 It cross-referenced several early scripts including the ‘jiaguwen’ oracle bone script. Here are some individual characters showing how the Shang dynasty character forms used on the oracle bones have evolved over three thousand years. The modern form for 'eye' is 目 mù; it used to be more of a picture and after rotation has now become stylized with the pupil shown as two straight lines. Today dog is represented 犬 quǎn; it was originally a picture which has now been rotated to stand on its feet. The 'dot' in the modern form represents the tongue. The modern form 龟 guī is just the head, shell and tail, the traditional form 龜 retained the two legs of the original. The tortoise was venerated as a very long lived creature and the tortoise shell itself was used in divination. The modern character for ‘woman; female’ 女 nǚ has a similar looking structure to the oracle bone representation. For ‘mother’ 母 mǔ the origin comes from ‘woman’ with two dots added to represent the breasts. The modern form is rather similar. The character for the abstract notion of ‘below; down’ 下 xià has changed with the shorter lower line anchored with a vertical stroke. The character for ‘up; above; on’ 上 shàng has changed in the same way as ‘below’, the shorter upper line has become anchored with a vertical stroke. 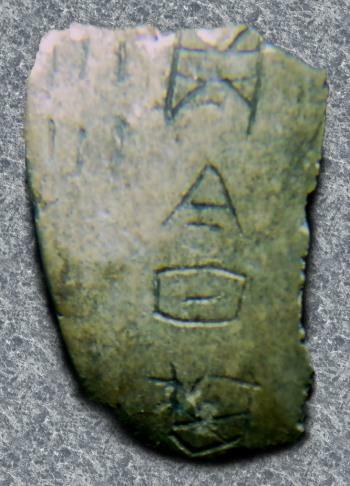 Citation information for this page : Chinasage, 'Early Chinese writing - Shang oracle bones', last updated 6 Dec 2016, Web, http://www.chinasage.info/oraclebones.htm.